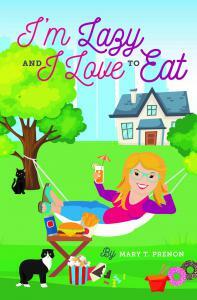 “I'm Lazy and I Love to Eat” is a comedic, true-life story of one woman's 19-year struggle to lose 50 pounds! It's full of funny stories plus great advice. CORTLANDT MANOR, NEW YORK, UNITED STATES, September 17, 2018 /EINPresswire.com/ — In 1998, Mary T. Prenon vowed to lose fifty pounds no matter how long it took. Nineteen years later, she finally achieved her goal and is ready to share her story with the world. The suburban New York City resident has just completed her first book, “I’m Lazy and I Love to Eat,” a short, inspirational yet humorous account of her almost two-decade struggle to drop the weight and get in shape. Portion control, negative body image, and the allure of countless fad diets were just a few of the hurdles she had to overcome. Sudden employment changes, the deaths of her father, godmother, and lifelong best friend, plus everyday stress caused many frustrating weight regains, but through it all, she never gave up. Prenon tells her story with laugh-out-loud relatability and heartbreaking honesty. In some chapters, she includes lightly disparaging poetry about her weight, which she wrote through the years. Most chapters conclude with a list of helpful hints, including how to stay motivated, find the right gym, make healthy eating choices and deal with inevitable setbacks. She ends the book with personal recommendations for easy-prep meals and a summarizing list of dos and don’ts. “I’m Lazy and I Love to Eat” is now available on Amazon.com and BarnesandNoble.com. Prenon holds a bachelor of arts in journalism from Temple University and has written nearly a thousand newspaper and magazine articles throughout her life. She has a background in broadcast and print news, and currently works full time as Communications Director for the Hudson Gateway Association of REALTOR® in White Plains, NY.